Experience the splendour of distinctive areas - discover landscapes, culture and people. Relish delicious regional cuisine - as you journey through carefully selected areas - at your own pace. Active, healthy and exiting ! 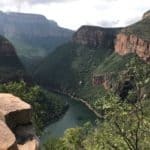 Kruger and Canyon Hikes now available. Kruger Park and the Blyde River Canyon. Book now !